We are delighted that Buddy's miraculous tale has been selected as one of the Top Ten National Finalists in Purina Pro Plan's Rally To Rescue's Doing More for Pets Rescue Stories Contest. That his story has been recognized is extremely heartwarming to all of us at Border Collies In Need and to the untold numbers of dogfighting victims. We hope that what these dogs endure will inspire you to vote for Buddy's story. You may view Buddy's video here, and his full story is told below. Wonderful news! Huey has been adopted! It is extremely gratifying to know that there are those out there that understand the needs and the value of the senior dog. Way to go, Huey and Joe! Huey is a distinquished 10 to 12 year-old senior black and white Border Collie mix with a beautiful rough coat. Huey's story began as a sad one, but this dog is living proof that even heartrending stories can achieve a happy ending. BCIN was contacted by Animal Control (AC) in April 2009 to help Huey. Huey was severely mauled when he was used as a bait dog for confidence building in competitive dog fighting. We have included photos below of Huey during and post-vetting. Be forewarned they are quite graphic, however we feel it important to show the horror of dog fighting. He was found alive, after being left for dead, suffering with serious wounds to his head and throat, loss of blood, dehydration, a punctured ear drum, and maggot infestation. Huey was slated for euthanization due to the extensive care he required. Unfortunately, there wasn't enough evidence to prosecute anyone for Crimes Against Animals. 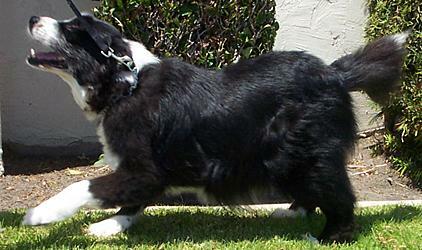 AC advocated to save Huey's life and called Border Collies In Need. Huey's extensive wounds required daily veterinarian visits and in-depth home care. Although Huey endured a lot of pain, he always managed a tail wag, and to lick appreciatively his foster mom's face. Huey's wounds are now healed and he continues to flourish in foster care. His wonderful personality and sweet temperament shine through and through. Despite his vicious attack, there isn't an ounce of aggressive behavior in this sweet boy. Huey has never met a stranger, whether it is human, canine, or feline. He just adores everyone he meets. Huey is a perfect gentleman in public and as a houseguest. His days now consist of being a pampered pooch, playing fetch and woofing for treats while he is waiting to be adopted into his forever home. Huey rides well in the car, is leash trained, housebroken, with nice house manners, and is obedience trained. He is quite toy-motivated and loves to play with them. He would make a wonderful companion animal. Although Huey is a senior, he still has energy and loves to go for walks. Huey is an inspiration to his foster mom, and he is a true testament that tender loving care heals all. Huey will be adopted under our senior program, please ask us for details. Huey is being fostered in the South Bay area of Los Angeles County.